Garage Door Systems in Ballymena is recruiting 17 additional staff to help deliver growing sales across Great Britain. The family business is a leading manufacturer of bespoke garage doors and is expecting its sales to grow by 50 per cent over the next three years due to a buoyant UK construction sector. Peter Doherty, Managing Director, Garage Door Systems’, said: “Our customer base within both the commercial and residential sectors is developing and we aim to continue to build on the valuable links established with distributors in Great Britain to further expand our market share. Garage Doors supplies a range of garage doors and external steel access doors for the domestic and professional markets and has an extensive showroom at its premises in Wakehurst Industrial Estate, Ballymena. 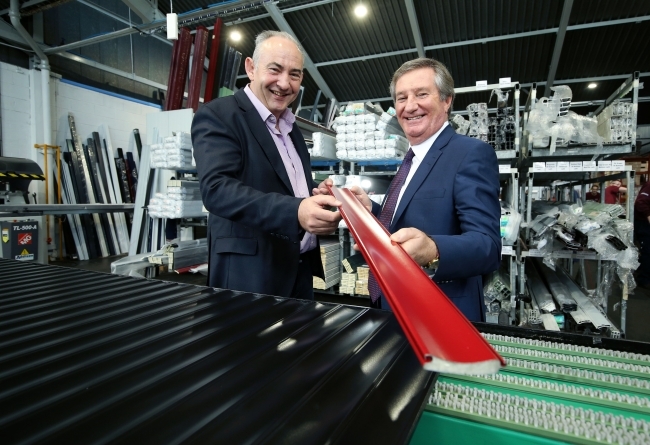 Bill Montgomery, Invest NI’s Director of Advanced Manufacturing and Engineering, added: “This investment is an important strategic commitment for Garage Doors, enabling the business to fulfil is growth potential, particularly in Great Britain. Its growing order book has been driven by innovative products and it is encouraging that the company continues to look for opportunities to widen its portfolio. Invest NI has offered Garage Doors Systems £127,500 to support its recruitment drive which is currently underway.